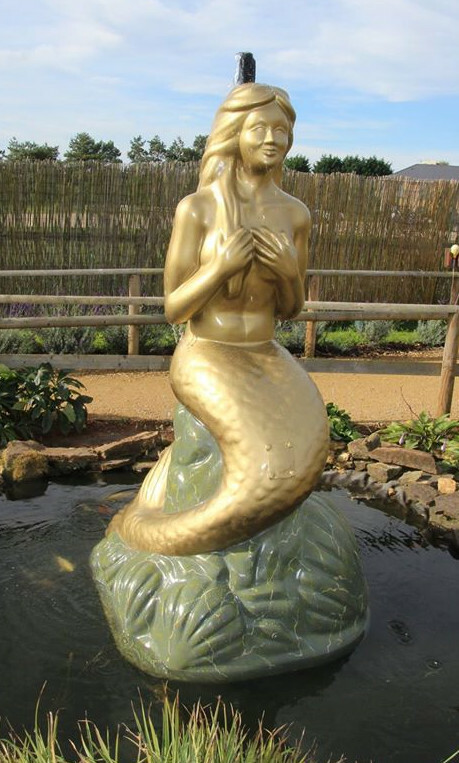 Fibreglass moulding – Blackpool Illumination – Mermaid Fountain. 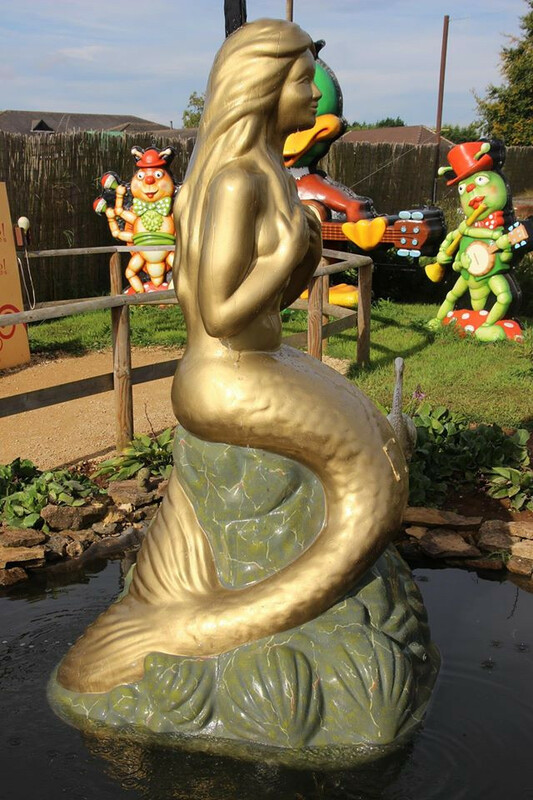 The Mermaid Fountain fibreglass moulding is a familiar feature at Fairy Tale Farm in Oxford. For some time though, she has not been looking her best. The old grey paint had cracked and flaked away; wear and tear and other repair work over the years also required my attention, and she had several redundant access holes cut into her. These I needed to cover. She also had a chimney-like fibreglass moulding protruding from her head that previously supported another structure. This it was decided I had to remove. I started off by carefully removing the old paint by hand with a chemical paint stripper. This removed most of the looser paint, but for much of it I had to use wire brushes and a scourer. Then I cut away parts of the fibreglass moulding that were no longer needed; patching up, reshaping and repairing around them. After filling any holes and imperfections with a polyester filler, I used an electric grinder and sander to take away most of the excess. I then used a hand sanding block to sand away smaller faults. When I was happy the surface was smooth and fault free I gave the fibreglass moulding a final fine sanding. I spray painted the rock a base colour. Then I applied brush and splatter marbling effects to add some realism. The mermaid I just spray painted all gold. Finally after I had applied several coats of lacquer to the entire fibreglass moulding, I turned on the water and refilled the pond. She took me 78 hours to lovingly repair, whilst balancing on planks over a half filled pond, trying my best to keep the dust and paint from harming the fish, frogs and plant life. The fish and frogs are fortunately still alive.